Bert Weckhuysen was on a China mission for the Ministry of Economic Affairs and Climate Policy. 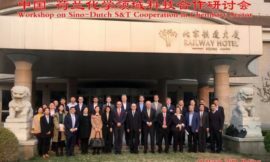 The goal was to foster scientific cooperation between industry and universities between the two countries and to develop research programs for cooperation with the Chinese Ministry of Science and Technology (MOST) within the Advanced Research Center Chemical Building Blocks Consortium (ARC CBBC). Weckhuysen also visited Peking University, where he gave the Physical Chemistry Chang-Ge Lecture. You can read more on the website of ARC CBBC.